Please find below a public legislative roadmap for three major federal legislative initiatives for electoral reforms. That is, bills in Congress for a stronger U.S. representative democracy. 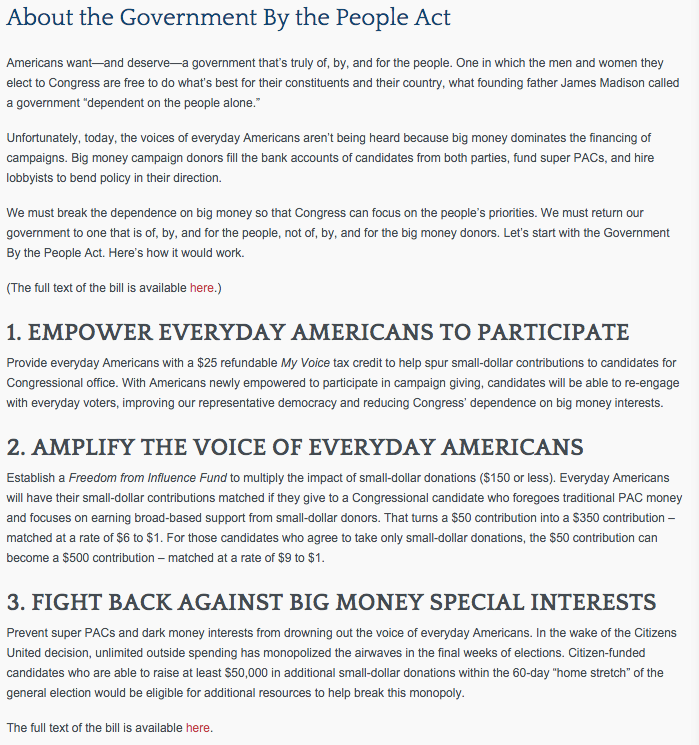 Each of these three legislative initiatives are composed of several bills, some active and some in previous Congresses – together, they formed the Citizen Equality Act of 2017 proposed by Prof. Lawrence Lessig in his 2015 Presidential campaign, but they have history going back to the founding of Public Campaign, a leading advocacy group for public financing, back in 1997 and before. The most-recent inspiration for this post is the terrible spate of U.S. firearms violence & mass shootings – and the seeming impossibility of greater gun control regulations through federal legislation, despite 85% of Americans favoring expanded background checks as a first step (per Pew Research, August 2015). For recent resources, see also Igor Volensky‘s massively-popular #thoughtsandprayers Tweets about NRA donations to members of Congress, covered on “All In with Chris Hayes” and massively re-tweeted. John Cassidy wrote a 2013 piece in the New Yorker on the NRA’s legislative opponents – at least five major groups, some grassroots, overlapping agendas. Public Campaign transitioned into EveryVoice Center (around early 2014?) – see their solutions page, which first promotes the site OfBy.Us, an educational homepage for the two public-matching-funds bills in the Senate and House of the previous 113th Congress of 2013-14. For more background, browse gallery of 32 money-in-politics issue groups on Issue One site, such as Represent.us and Rootstrikers and more. Note: we built AskThem as a free platform for continual conversation with people in power – to break information like the below out of old blog posts, legislative documents, and social media silos, and continually raise it for an official response and public accountability. So in addition to asking good questions about the legislative roadmap for bills below (or conducting ‘public whip counts’), you can ask questions to advocacy organizations and political analysts. 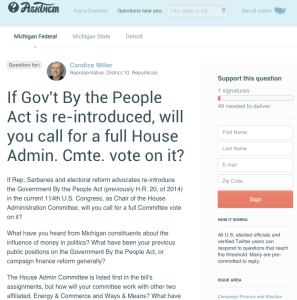 Sign-on and spread the word to my just-published public question. and coming as close to a system of full public financing of elections as possible, given current Supreme Court composition and Citizens United ruling. … of course, many money-in-politics reforms & electoral reforms can & should work in concert. S. 1659 – intro’d 6/24/15, spon. Sen. Leahy (D-VT), next step: Senate Judiciary Cmte. Will seek more info. H.R. 12 – intro’d 3/19/15, spon. Red. Lewis (D-GA), next step: six House committees, e.g. 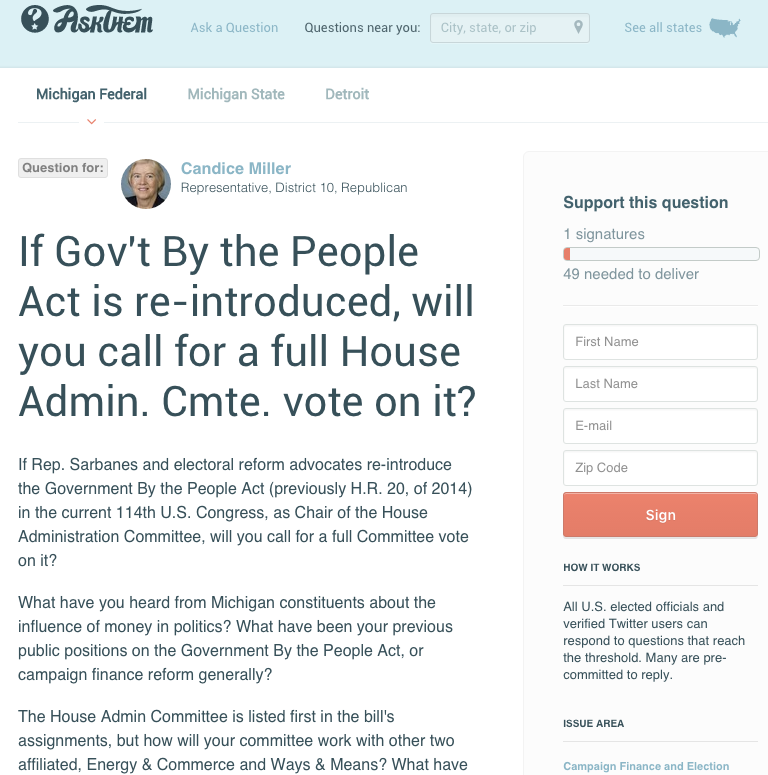 House Admin & Chair Rep. Candice Miller (R, MI – 10) – counties of Huron, Lapeer, St. Clair, and Sanilac, as well as most of northern Macomb County. Will seek more info. FairVote.org is working on building popular support to be introduced, “Ranked Choice Voting Act”, full text – to be implemented after 2020 census. I’ll seek to get the text from this and put it up on non-profit myMadison platform for annotation & comment. 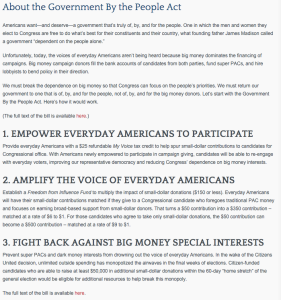 FairVote campaign page – the idea is: larger, independently-drawn districts send between three and five members to Congress as their delegation, as multiple winning reps, to prevent single-party monopolies. More info on Score Voting (related but different). Two bills form the “Government By the People” Act, providing tax credits for small-donor contributions, limits of $150 per donor, and then 6-1 matching public funds for qualifying candidates. The 6-1 match – currently in place in several states – is the model seen as most viable to be upheld in legal challenges, rather than full public financing systems. More info & extensive citations: attorney Adam Lioz, Demos. Senate: S. 2023, Fair Elections Now Act of 2014 – intro’d 2/12/14, spon. Sen. Durbin (D-IL), next step: re-introduce in current 114th Congress. Will seek more info. House: H.R. 20, Government By the People Act of 2014 – intro’d 2/05/14, spon. Rep. Sarbanes (D-MD), next step: re-introduce in current 114th Congress. Will seek more info. More info forthcoming on next steps for these bills in the current 114th Congress and beyond – will seek feedback from EveryVoice legislative staff & welcome others. Studies: Demos, Apr. 2013 on CT public financing; May ’07 report from CT office of legislative research on how public financing boosted voter turnout; NCSL intro resource on 13 states with some sort of public financing; Ballotpedia page; Arizona Clean Elections official FAQ; Public Integrity state integrity ratings 2015; Brennan Center Issue Page & NYC studies & 2012 federal small-donor report (Fred Wertheimer co-author); Public Campaign history; EveryVoice solutions. Anti-Corruption Act from Represent.us, nine components, in short: close the revolving door, increase disclosure, limit lobbyist donations, end secret money. Aimed to be remixed for any federal, state, and city level of government. Towards Ending the Iowa Caucus / New Hampshire Primary Front-Loading – amend the bylaws of the DNC & RNC. Membership is in-hand, AskThem question campaign forthcoming – this info was previously available on PPF’s OpenCongress Wiki (deprecated), through a partnership with dKos Elections on the SuperDelegate Transparency Project, but is not displayed on the DNC’s Democrats.org site of course, and is generally not easily findable. But PFP has the membership list in-hand now, get in touch. Input & questions welcome, we especially hope to make these visualizations better designed and to share timely info – e.g. next steps on the Government By the People Act – with greater audiences. Email: david at ppolitics doo0t org, davidmooreppf on Skype, @ppolitics on micropub & dreaded social networking service. Appreciated: greater sharing of research on how a more trustworthy and publicly-financed electoral process can improve voter turnout rates and other metrics of civic participation. See resources of DemocracySpot from @participatory, The GovLab, Participedia, and more. Another thought, for anyone reading down this far – how many money-in-politics groups could consolidate, and how much could the branding get behind one reform bill in Congress? Then which communities can mobilize public pressure for a vote by the full committee? (Unlikely, perhaps, given various leadership incentives, but what other mechanisms are there for public leverage?) Help our non-profit organization liberate this public info for more participation!